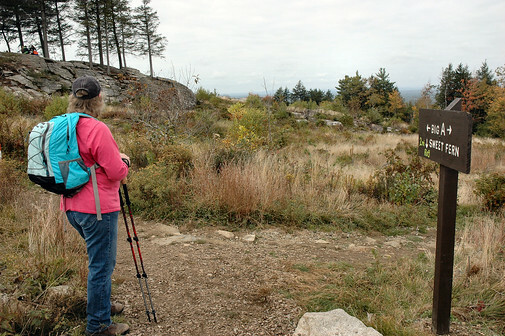 We were looking for a good introductory hike with a little climbing to rehab from my stroke. 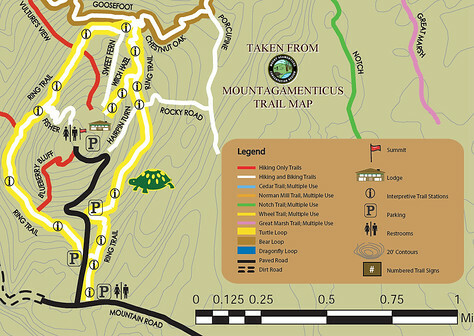 We saw a TV program about Mt Agamenticus, and it looked like it would fill the bill - short, (2.2 mi round trip by the "Turtle Loop",) a little climbing, (692 ft,) but no hand-over-hand, and facilities at the summit! 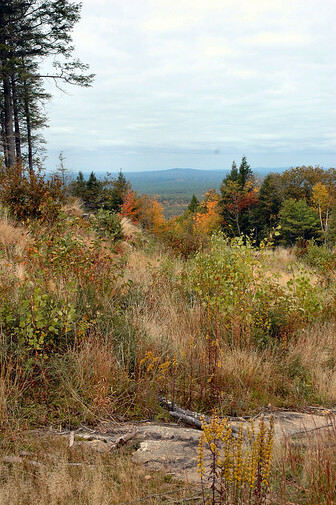 Mt Agamenticus is an easy drive off Rte 95 in York, Maine. 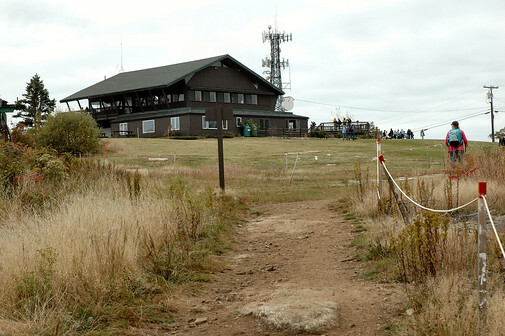 There are numerous parking areas along the summit road. 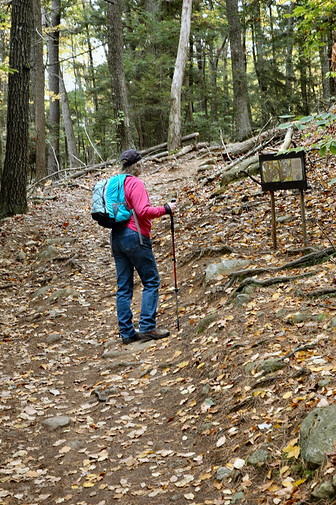 We parked at the bottom and started up the Ring trail and followed it in a clockwise direction to the Witch Hazel trail that leads to the summit. 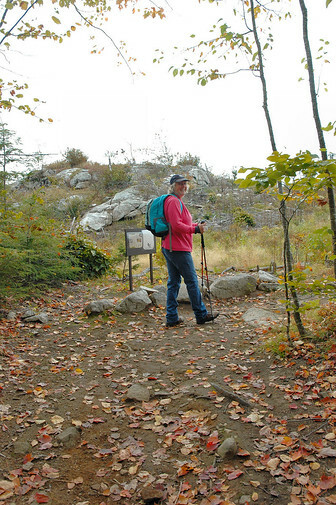 The "Turtle Loop" is a relatively easy interpretive loop with some more or less gentle ups and downs and some rocky and rooty areas, especially where it steepens. All trails are very well marked. Here and there we were treated to a glimpse of the scenic vista that was to come. 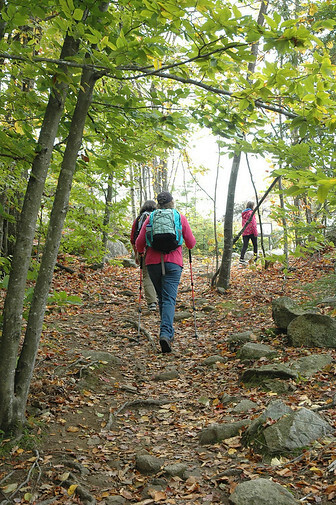 On the Witch Hazel trail leading to the summit, the going gets a little steeper and more rugged, but not bad at all. 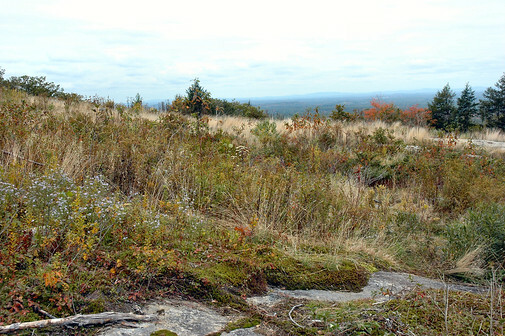 The summit of Mt Agamenticus is mostly treeless, but a great variety of grasses and shrubs grow exuberantly between the rocky outcroppings. 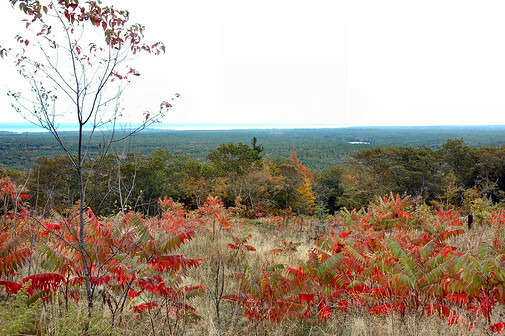 It has more the look of a post-glacial meadow than a wild and woolly mountaintop. And, (How civilized can you get?) a lodge at the top! not to mention porta-potties and picnic tables. We had a nice picnic at one of the tables and enjoyed the view. Afterwards, I walked around the summit perimeter and took some pictures. 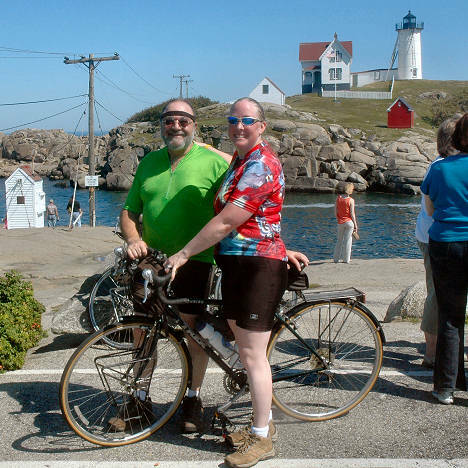 There are also two viewing stands on the summit, affording a spectacular 360° view -- to the east, the Atlantic ocean, Cape Neddick, and even Cape Ann, and to the west, the White Mountains. Cape Neddick just behind the right branch of the tree, and Cape Ann off in the distance on the right. 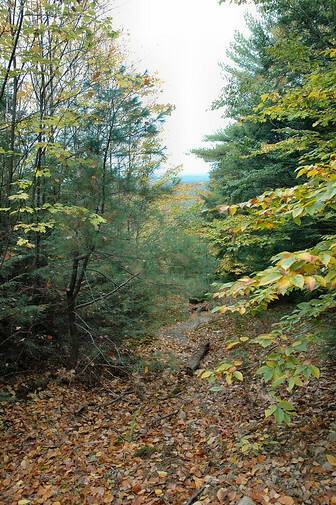 We went back down the Witch Hazel trail, and took the Ring trail down the East side of the mountain. It seemed a little steeper and a bit more rugged than the trip up, but, again, not bad. We did get briefly lost when the Ring trail seemed to end at the summit road. After going out on the summit road and not finding the continuation of the trail, we discovered that the trail actually took a hard left as it touched the road, and we continued on our way. All in all a very enjoyable hike and some spectacular scenery were just what the doctor ordered.